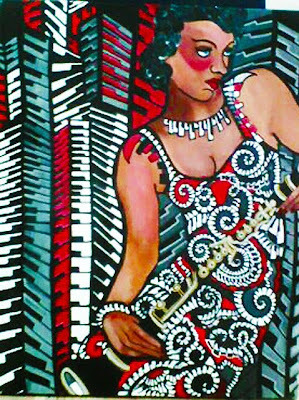 Mia Malone- Jennings’ collection of acrylics on canvas art work has been exhibited at The Carleton Artist Lofts, The Lyric, Saint Paul Art Crawls, 3 Minute Egg with Matt Peiken, The Urban Art Shows, Mill District Art Gallery, Altered Aesthetics Gallery, Density Studios, Outsiders and Others Gallery, Steven’s Square Center for the Arts, Minneapolis Convention Center, Minnesota Black Music Awards 2010, Pantages Theater. Seven Ultra Lounge, and First Avenue Nightclub. Her art work also appears on Minneapolis Television Network, where she has been creating a tribute mural to television history, over the past three years. Her work has also aired on Keith Porter’s program which airs on MTN, A Picturesque View. 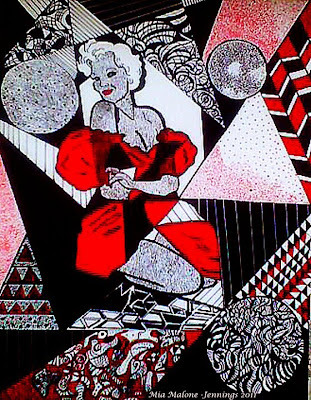 I’m currently working on a collection of art that is done with Sharpie pens and markers, some are created in a pin up girl style and some are done with a dance theme. Ten of my portraits will be exhibited at the Urban Arts Show, A Night of Art and Dance, 4-9-2011 at the Urban Arts Studio in St. Paul. I had foot surgery seven weeks ago. 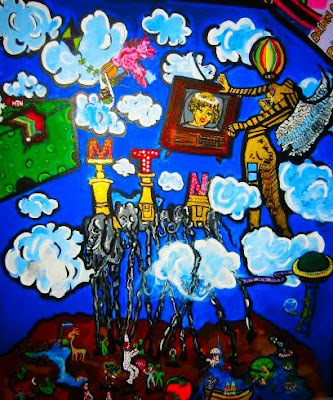 I was currently working on the Minneapolis Television Network Mural with acrylic paints, prior to my surgery. During my recovery, I had to find a way to do art work while sitting in a recliner chair with my foot elevated, which is why I am doing this new collection with Sharpie pens and markers. It’s difficult for me to paint sitting down. This new medium seemed to be the perfect answer to my dilemma. I don’t like to sit still and I don’t like to be non-creative. I really enjoy this new form of art. I feel like a kid again, coloring designs, images, and using the method of stippling. I like to venture out of my comfort zone and learn new skills and techniques. In between paintings for the upcoming Urban Arts Show, I have been sketching television celebrities and vintage T.V. Guide covers, on paper, with a variety of shades of pencils, which will be part of the Minneapolis Television Network mural project. This article is an interview I did for the MTN Monitor a few years ago, regarding the mural project. During my recovery time, I have also been researching new techniques, such as learning to use an airbrush, and discovering new designs for an upcoming project with the Minnesota Black Music Awards 2011, which I’ll need to begin this Spring. I’m excited to work with them again, creating something entirely new, vibrant, and full of Minneapolis’ black music history. I began the Minneapolis Television Network mural project three years ago in July, which is a large scale mural, and is a tribute to television history. You can view a majority of my work at MTN.ORG, (Click the “about MTN” icon, scroll down the “about MTN” column on the left hand side, and click on the photos). A majority of the work at MTN is done with vibrant acrylic paints on many of the walls and editing rooms. My favorite part is the Mars editing room on the second floor at the MTN studios. I’ve been working on it for over two years. The detail of my work is done in 3D. The room appears as if you are inside a space ship overlooking Mars landscape. I never thought I could do something like this. But, with the encouragement of one of the MTN staff, I found the inspiration to do so. I truly enjoy my mural project at MTN studios. It feels like home to me. It’s been a major part of my life for several years. I began this project, taking dark, uninspiring work – space, creating something with a lot of color, vibrancy, creativity, high energy and television history. I’m looking forward to returning to finish this project when my foot is healed. To me art is creativity and life. It’s in so many things we do, ie; cooking, painting, drawing, sewing, dancing, performing, in our fashion and the way we dress, hair styles, decorating our offices, homes, community buildings, it’s in our architecture, it’s in a mother who’s creating new life, and it’s even in the daily drama in our lives, etc. (the list could go forever). What I want to portray in my art is life, electricity, vibrancy, passion, mystery, high energy, and whimsical visions. I want people to feel the playful spirit of a child. I want the ability to touch a million eyes, hearts and souls and make them feel something when they look at my work. I want people to feel the same kind of passion I feel when I am painting. I want people to feel joy and lighthearted. If I can bring just a bit of positive energy into someone’s life with my art work, I would die a very happy woman. If I can continue to do that with my paintings long after I’m gone, I would feel that every bit of my life lived would’ve been well worth it! My main creative space is at the Lyrics in Saint Paul. I have a beautiful apartment with an amazing view! I have a den where I work. I study a lot of books and magazines on other artists. I also like to look through books and magazines for pictures that might inspire me. I read many books or articles on art techniques, and I view a lot of pictures in many comic books. Sometimes I like to paint places I have visited, like New York City, which is my favorite place to visit. I take a lot of photos when I’m there and get inspired to paint from some of these photographs. I enjoy working during the twilight hours, with my fireplace on, flames of fire flickering, between midnight and 7 am, because it’s quiet and serene. I also need to listen to audio books while creating. It’s easier for me to slip into the zone while listening to a good audio book. J.D. Robbs’ detective novels, Detective Eve Dallas and her husband Roarke, move me into another time and space. I forget about everything and permit my soul to travel wherever in the realms of the imagination. I also love to adventure with Harry Potter, especially if it’s late at night. My favorite artist is Erik R. Pearson http://www.ensnared.net/ep/. He is known for painting the mural at the Bloomington Arts Center. He has such a whimsical way of painting. I feel a rush of good energy whenever I view his work. We used to be neighbors at the Carleton Lofts. He’s very genuine and humble. 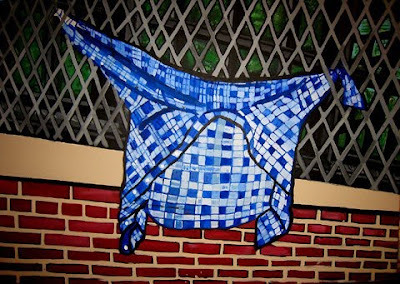 I really enjoy the art of April Erickson who is the director of the Urban Arts Committee. She shows her work often at the Urban Art Show. The color and vibrancy of April’s work is outstanding. The lines and curves in her work are sensuous. My heart races and adrenaline intoxicates my brain whenever I view her art work. Brant Kingman is another artist whose work awes me. I love the large portrait he did of Marilyn Monroe with recycled cans in his studio. It’s simply amazing! You would find me at the Walker, MIA, or Uptown at a gallery, or a comic book store or used book stores looking through dozens of art and comic books. I also view art in life and love to people watch. Some of my favorite places to do so are Como Park, the Walker Art Garden, Uptown, Dinkytown, Nicollet Mall, Stone Arch Bridge area, antique stores, Taylor’s Falls, and even shopping malls. 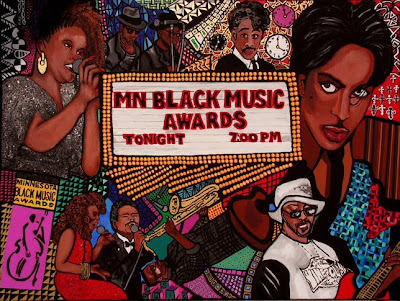 You can expect to see my art work for the Minnesota Black Music Awards 2011, and my finished mural on television history at Minneapolis Television Network sometime soon. – mtn.org. Read another interview with Mia on the site, Notes From Art-Chelsea.